There is a magician in Niedermorschwihr. His name is Jean Boxler, the grandson of Albert, who founded the firm. Jean Boxler wielding his wand - baguette in French - of Grand Cru Sommerberg which rises with a slope of 45 degrees near the village, like the Grand Cru Brand. Brand is an amphitheater that slopes down to Colmar. All wines, regardless of grape variety or quality level, is top class in its category. 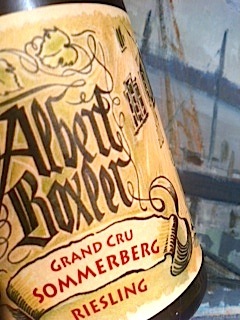 2009 Riesling Grand Cru Sommerberg Jeunes Vignes from Albert Boxler is glistening golden yellow. The aroma is rich and ripe with apple pie and a hint of botrytis (?) which gives complexity (ethyl acetate). The taste is medium bodied, fresh and rich with good acidity, nice minerality and a hint of heat, so typical of the vintage. The finish is long and vibrant. A wine that is a bit more accessible than the firm's flagships "D", "E" and "K". Price: €17. I was very impressed with the wines, as well as the reception, when I visited one year ago - and I bought this specific wine, and managed to lay my hands of 2 of the 3 others as well (one in Riquewihr, because it was sold out at the domaine). You are darn right. But I think that the young couple are pretty satisfied with staying out of the limelight. They have no problems to sell their wines at prices that are win-win. It is hard to decipher the codes (unless you consult my web sites or buy my book). One funny anectode: During my visit a few weeks ago I checked if the codes I have in my book were the same as the ones on the labels. Then I found that the current Muscat was labeled L20, just as the Pinot Blanc. Confused, I asked Mrs Boxler who blushed: there was an error. It should have been L40. Maybe this label will be as valuable as the Swedish 3 Shilling Banco stamp one day. Nevertheless, I have a lot of respect for Boxler and I think it is OK that they spend time playing football with their kids instead of working on a web site.